Neighboring States/UTs: Karnataka, Tamil Nadu and Lakshdweep Is. Main Political Party: INC, CPI-M, Muslim league Kerala State Committe, Kerala Congress (M), Kerala Congress, CPI, JD(S), Revolutionary Socialist Party of Kerala, Kerala Congress (b), Kerala Congress (J), CMP, Democratic Indira Congress, NCP. Major Religions: Hinduism, Islam, Christianiity. Main Towns: Thiruvananthpuram, Kochi Kozhikode, Trissur, Kannur, Kottayam, Kolam, Allapuzha, Palakkad, Malappuram, Pathanamthitta. (b) Mountains: Anmala (8841 ft, the Highest), Karinkulam (8455ft), Mukutti (8330ft), Devimala (8273 ft) Highest Peak-Anamudi 2695 msl. 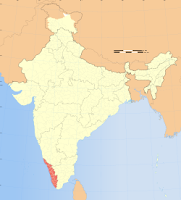 (d) Beaches: Kovalam, Varkala, Vizhinjam, Shankumkham-Trvandrum, Muzhapilangad and Payyambalam-Kannur, Kapad-Kozhikode. (e) Hill Stations: Munnar Nelliyampathy. (g) Wildlife: Eravikulam National Park-known for Nilgiri Tahr, Periyar N.Park, Parambikulam N.Park, Silent Valley, Peppara N.Park. (h) Waterfalls: Palaruvi, Athirapalli, Vazhachal. (c) Agricultural Products: The state has progressive in commercial agriculture more than food crops. Consequently the state is in shortage of food grains. State of Kerala accounts for 91% of India’s rubber, 70% of coconut, 60% of tapioca and nearly 100% of lemon grass oil. Kerala is the sole largest producer of a sum of other crops like banana & ginger, moreover tea and coffee in abundance. 50% people engaged in agriculture field. Main Irrigation Projects: Malampuzha, Chalakkudy, Peechi, Pamba, Periyar, Chitoorpuzha, Kuttiyadi, Neyyar, Chimmini. Main Power Projects: ldukki Hy, Pallivasal Hy, Chenkulam Hy, peringalkut Hy, Neriyamangalam Hy, Paniyar Hy, Sabarigiri Hy, Sholayar Hy, Brahmapuram Diesel, Kanjikode Wind farm, Kozhikode Diesel, Kayamakulam Thermal Power plant. (e) Inland waterways: 1687 kms. Education: The first fully literate municipal town (Kottayam-1989), and district (Ernakulam-1990) in India are in Kerala. Ln 1991, Kerala became the first fully literate state in India with literacy among adults: 89.9%. (b) Festivals: Onam, Vishu, Ramzan, Christmas, Aluva Shivratri. Famous Shrines: Jewish Synagogue (Mattancherry, Kochi)-St Francis Church-Kochi, Padmanabhaswamy temple-Trivandrum, Ayyappa temple-Sabarimala, Guruvayoor (Lord Krishna shrine)- Trivandrum, Methala mosque, Malik Dinar Mosque, St Thomas Memorial Church-Kodungalloor, St Thomas Church-Malayatoor, Mannarasala temple-Harippad, Parimala Church, and Kalady (the birthplace of Sri Sankaracharya.